Concept artists work across diverse industries – automotive, video games, animation, theater, movies and toys – to bring ideas to life. Recently, Senior Concept Artist Chris Bourassa at Vancouver-based Propaganda Games shared some of his tips for emerging artists interested in working on concept art for video games and film. AYAW: What are some of the types of projects a concept art department handles? Are you designing characters, creating scenery for game levels, brainstorming the look and feel of the video game, or something completely different? CB: For a concept artist’s role, you’ve pretty much covered it. You will work with an Art Director who establishes the parameters of the high-level vision and your job is to distill that vision into illustrations so the 3-D modelers have material to work from. Characters, props, environments, game play maps and ideas, weapons, icons – you can expect a mixed bag of tasks. AYAW: What’s your advice to rookies in this field or aspiring concept artists? CB: Early on, you need to be willing to try anything, draw anything, in any style as best you can. There are a million great illustrators out there, but concept art is more about design and communication than it is about polished and refined art. Great written and verbal communication skills are important too. AYAW: What kind of skills do you use on the job – are you working primarily with 3-D modeling materials, computer programs, or traditional mediums? CB: I work primarily with Photoshop for all my digital paintings. Other concept artists here use Maya and/or Google Sketchup to create base geometry on which to paint. AYAW: What are some of the highs and lows in the life of a concept artist? CB: You get to work with other talented artists, be a part of something bigger than you alone could have made. You get to see your characters and environments realized in 3-D, with lighting, voices, animation – that’s my favorite part of the job, hands down. Deadlines are ever-present and usually quite tight. You have to get comfortable working under a certain amount of pressure. There hundreds of last minute requests and tasks that pop up out of nowhere and that can be hard to juggle. In this industry, it’s never a good idea to get too attached to a painting. In game production, we don’t paint art, we paint ideas. An image will be changed, thrown out, reused, edited, cropped, color corrected – you name it. You may get feedback you hate, or you may be asked to dramatically change what you think is a good image. Concept art exists to explore different directions and, sadly, many of the directions are dead ends. AYAW: How did you get started? CB: I did a BA in Sociology, then came out to Vancouver because I wanted to get into art for TV or games and did a 16-month digital animation diploma program. Even with classes, I had to work really hard on my own to bring my animation demo reel up to snuff. But employment in this field is determined by three things: the quality of your work, how well you interview, and who you know. The portfolio is particularly important. AYAW: Any general tips about preparing a portfolio for concept art? CB: Adaptability is critical. 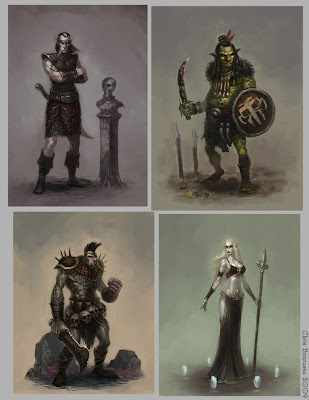 Specifically in concept art, a portfolio needs to show some variations/iterations. For example, draw an orc in a loincloth, copy it 9 times and do 9 different costumes. This shows that you can provide an art director with options. Indecisive art directors love options. When you get a job, you aren’t working for yourself, so no matter how much you may love dragons, a portfolio full of them isn’t going to get you far. You will rarely get the time to do a finished, polished piece as a concept artist, so being able to show solid, dynamic medium polish images with a few supporting sketches is a must, in my opinion. New hires need to demonstrate a good range of skills, read: don’t draw just spaceships. AYAW: Any last words of wisdom? CB: The most important thing I can say is, if you want a job drawing, then you have to draw. Carry a sketchbook everywhere, go to life drawing, read about art. Think critically about what areas in your skill set you need to improve. Contrary to popular belief, being a good artist is 90% practice and only 10% talent. Image Credit: Character Designs for Online Video Game. Copyright: Chris Bourassa.